MIMS is the print and online prescribing database for all healthcare professionals. First published in 1959, MIMS has grown to be the essential choice of prescribing and clinical reference for all healthcare professionals. The MIMS website is updated constantly, providing news on drug launches and licence changes together with clinical guideline updates. The MIMS book is published every quarter and is sent free of charge to the practice addresses of all UK-based GPs who complete our online registration form . If you have already registered and need to change your mailing address, please call 0845 136 93 16 or email medicalcirculation@haymarket.com including your name, surgery address and GMC number. Other relevant healthcare professionals may subscribe to MIMS by emailing subscriptions@haymarket.com . 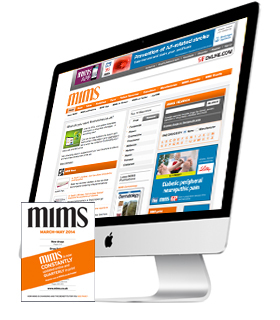 MIMS is available as an app for Apple and Android devices for only £9.99 a year. MIMS won the PPA digital directory of the year in 2012. Download it now to receive over 300 updates every month. MIMS online is part of the GPonline network of sites. The online version of MIMS contains additional resources and registration provides GPs with free access to the MIMS database of drugs and products. Registering with MIMS online also gives you access to our regular MIMS email bulletins and other key email alerts from GPonline. MIMS database drug search : search the MIMS database for drug information including indications, doses, side effects, interactions, contraindications and warnings. Browse drugs by therapeutic area or use the search box to extend your search to tables, guidelines, patient resources and news. Quick reference tables : clinical and comparison tables ordered by therapeutic area. Clinical guidelines including NICE guidance : over 140 clinical guideline summaries browsable by therapeutic area . Travel vaccination and malaria prophylaxis advice : latest immunisation recommendations and antimalarial regimens ordered A-Z by country. Clinical calculators : links to simple but essential clinical calculators for body mass index (BMI) , baby's age , pregnancy due date and more. Pharmaceutical manufacturers : find the products produced by a drug company, organised alphabetically by company name. If you have any questions or comments about MIMS, please see our Contact Us and Advertising Information pages. A new beclometasone metered-dose inhaler and a new salmeterol/fluticasone breath-actuated inhaler are now available to prescribe. Half of patients prescribed statins fail to reach their target cholesterol levels within two years, according to the results of a large UK study. The SGLT2 inhibitor dapagliflozin (Forxiga) can now be prescribed with insulin to treat overweight patients with type I diabetes inadequately controlled on insulin alone.